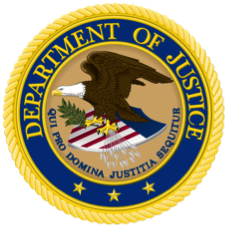 The Justice Department shared a press release at the end of February, announcing the largest coordinated elder fraud sweep in US history. The case resulted in criminal charges against 200 individuals who exploited over a million seniors of half a billion dollars. The sweep included a range of fraud schemes—from mass mailing, telemarketing and investment frauds to individual identity theft events and thefts involving guardians. Numerous cases involved criminal organizations that defrauded hundreds of thousands of older victims across the country, while others involved a single relative or fiduciary who exploited an individual victim. Articles in TIME and Financial Advisor mentioned EverSafe and the importance of being proactive when it comes to monitoring finances and identifying and reporting suspicious activity. In a March piece on scams commonly targeting older, vulnerable victims, Kiplinger focused on the issue of underreporting. As the populations ages, “…at best 80% of cases are never reported to anyone–and at worst, 95%” according to Bennett Blum, a physician specializing in forensic and geriatric psychiatry. The importance of monitoring is emphasized with EverSafe recommended as a tool to safeguard against senior scammers. On March 14th, the U.S. Senate passed the Senior Safe Act, as part of the bipartisan Economic Growth, Regulatory Relief, and Consumer Protection Act. (S.2155) In sum, the bill protects financial advisors and firms from liability if, based on reasonable suspicion, they report suspected financial exploitation of older adult customers. On March 7th, the Senate Special Committee on Aging held a hearing on Capitol Hill entitled “Stopping Senior Scams.” The full video is available here. 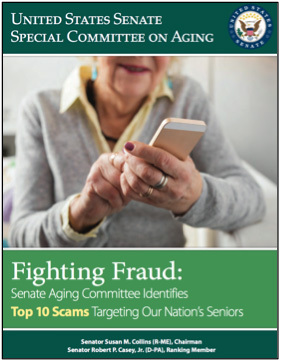 The Committee shared a listing of the top 10 current types of scams targeting older adults in the United States. They included: fraud schemes involving IRS impersonators, government grant scams, unscrupulous sweepstakes offers, robocalls, computer “technology support” fraud and the “Can You Hear Me?” scam. The full book is available here. Consumers who suspect that this kind of activity is occurring can report it to the Senate Committee’s Fraud Hotline at 1-855-303-9470. Given the recent Equifax breach, in which more than half of Americans’ personal information was exposed, it’s important to be on the lookout for fraudsters who may have enough information to file a false tax return in a victim’s name. 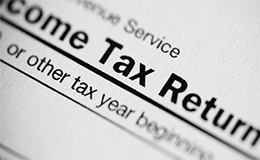 A popular IRS scam involves fraudsters who submit the phony return to obtain a refund. Social Security numbers were among other data exposed in the massive breach, which helps pave the way for this kind of scheme. Are there ways to protect consumers? Many experts say that the best thing one can do is to file early. Filing early may very well beat the scammer at his or her own game. Another tip? 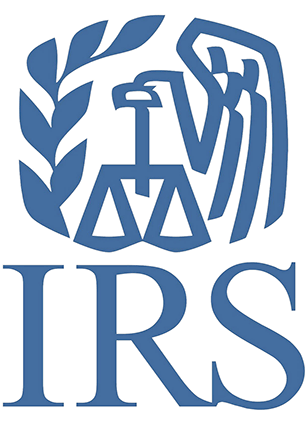 The IRS offers identify theft protection PIN numbers, which are used to prevent a fraudster from filing a phony tax return with a stolen Social Security number. This six-digit number must be used whenever one files with the IRS. Finally, monitoring financial accounts has never been more critical. Scammers open unauthorized depository (e.g. checking, savings) accounts in victims’ names, and use these accounts to deposit their phony refunds. Credit monitoring alone will not alert consumers to these illegitimate depository accounts. Using a technology platform that alerts consumers to unauthorized depository accounts in their name can shut down the IRS phony refund scheme. More information on how seniors may be targeted for tax fraud can be found here.